As a clean power supply, hydropower has many benefits to the electrical grid. It is renewable, comparatively affordable and a low-carbon technology. Being close to water typically brings strong economic development and prosperity. The ancient Egyptians knew this, and owed the blossoming of their culture to the Nile River. Even today, underdeveloped regions can grow swiftly when they establish hydropower. The development of new hydropower plants brings new opportunities, people and jobs, all while expanding an area’s infrastructure. In many regions, the addition of hydropower has been the crucial trigger for an economic and social boom. An example of this is the Montafon region in Vorarlberg, Austria. The Montafon is an almost 40 kilometre long valley in Vorarlberg, Austria. It reaches from the Bielerhöhe to Bludenz and is crossed by the Ill. The picturesque surroundings are crowned by the 3,312-metre-high Piz Buin in the Silvretta Group. 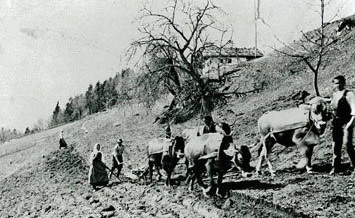 In the middle of the 19th century, the Montafon valley was still one of the poorest regions in Europe. Most of the nearly 8,000 inhabitants lived from agriculture. Resources were scarce and a third of the population had to work outside the valley as seasonal workers. Conditions changed with the founding of Vorarlberger Illwerke in the 1920s. Even the construction of the first hydroelectric power station in 1926 led to a massive expansion of the infrastructure: high alpine locations were made accessible by paths, roads and cable cars. This had the positive side effect that the Montafon suddenly also became attractive for summer and winter tourists. Even prominent winter sports enthusiasts found their way into the picturesque valley - Ernest Hemingway, for example. Due to the enclosed landscape, such an economic flourishing would have been unthinkable before the construction of the Illwerke. Now the building and operation of the power plants, roads and mountain railways offered jobs for many people. The Illwerke are still the largest employer in the Montafon today. The construction sector also profits from this development. The best-known example is the construction company Jäger, which is active worldwide today. Around 18,000 people live in the Montafon today. Most of them are no longer employed in agriculture, but in the service sector, above all in tourism. Whereas in 1934 57 percent of them were still working in the surrounding farmlands, 60 years later the figure was only 5 percent. The new transport connections are enormously important for the region, as they open the valley to tourism. At the beginning of the 1950s, they turned a narrow cart track into a single-lane construction road for the Obervermuntwerk. Later, the Silvrettahochalpenstraße was created - today one of the busiest panoramic roads in Austria with an average of 400,000 visitors per year.